SAGA-Property version 2.8.9 has been released. Offices where the new version has been deployed will see the new SAGA-Property logo and see version number of 2.8.9 at the login page. That will make the system better and more user friendly. Please continue to send us any ideas you have. Search panel has been improved and moved together in one line. Number of Searching any text or specific text (like address or parts of address) is now more static and the search will keep even changing from property list to rental list. The page size(number of properties) selection is also in the search bar. In property details there are number of changes smaller changes to improve the data entry. Selection of available portals made more visible and easier to use. When property is being sent to portals it shows on the property page. So by refreshing, the user can see if the property has been sent to each portal. For each property there are links directly to the property in each portal it has been sent to. By clicking on the link a browser window will open on that portal with the selected property. 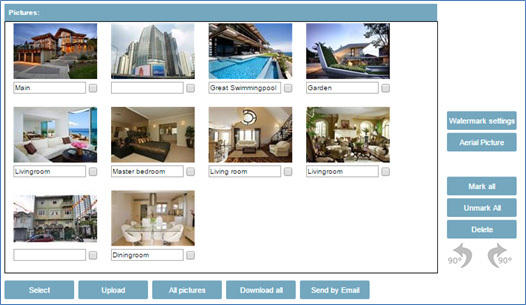 Now it is possible to use Drag/Drop to add photos to property. Photos on desktop or in folders can be selected using the mouse and dragged over the photo window and dropped there. Then all the photos will be uploaded to this property. Descriptive text can then be added and photos rearranged at will. By clicking in the photo window, a file selection window will open and multiple photos can be selected and are uploaded right away. This improves easier addition and management of photos.